$8.95 In stock. Order in the next 7 hours, 34 minutes and it will go out today! 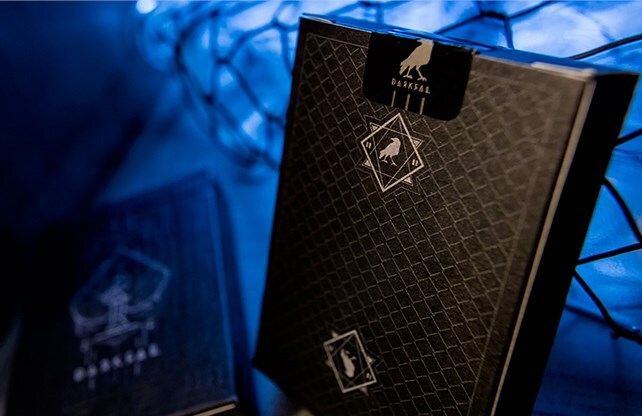 Darkfall is a dark looking deck inside and out, and the darkness begins with our all-black tuck box. Despite its dark look, the box does hold multiple secrets that the attentive observer will pick up. 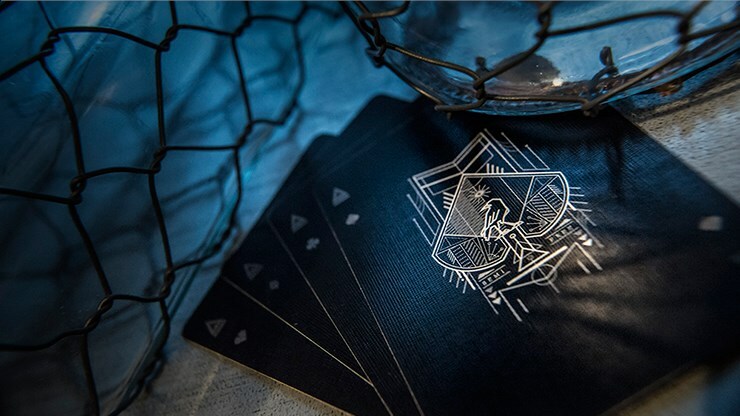 First of all, there's a very detailed and tactile embossed design, with light grey image featuring the Ace of Spades inspired artwork that incorporates a raven. The reverse side of the box has artwork that matches the card backs, with a light grey chain-link style tiled design, and two ornate diamond shaped pips. Each of these pips is the result of combining a square with two triangles, and incorporates our raven companion. We're going to see a lot of the raven in this deck, given its long-time association with night! This deck is black - all black. The official promo video for the deck explains why, because it introduces us to a gritty nightscape city scene, where street artists use the cover of night to turn an urban playground into their canvas. 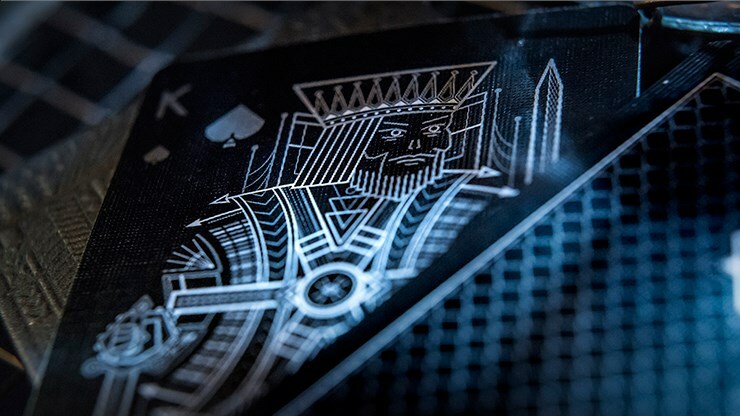 The card backs are exactly what the tuck case has prepared us for: the same image as the back of the box, but with a bolder jet black colour against the background of which the light grey design and images stand out more clearly. 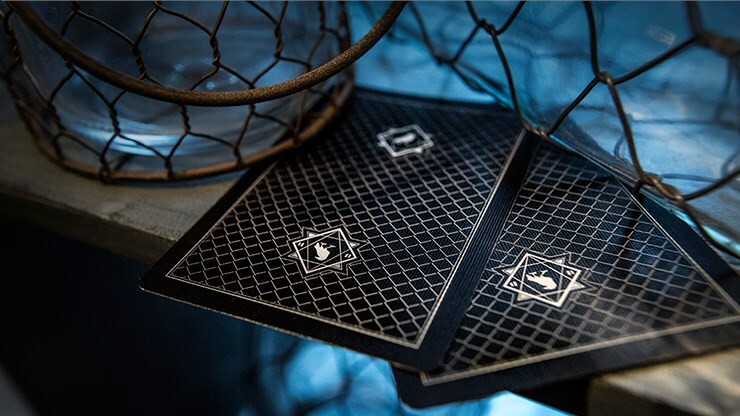 The black borders of the card backs serve as an enclosure for the main design, which appear to depict a chain-link style fence - representing precisely the kinds of restrictions that street artists must use the cover of night to navigate past. It's also a one-way back design, due to the ravens all facing the same direction. 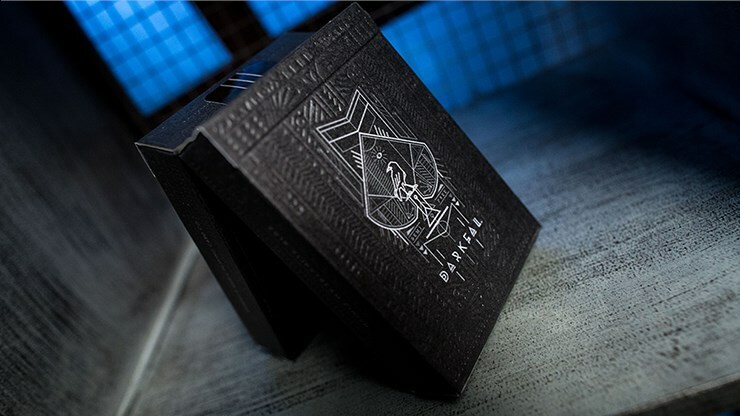 The Ace of Spades also repeats the design on the tuck box cover. There's lots of symbolism here - including a seeing eye, and a raven on a platform, for example - all open to interpretation. There's a few things that immediately strike us here, including the fact that this deck offers jet black faces as well as backs. Also noteworthy here are the small pips on the indices, which feature an unusual letter style, especially in the case of A for Ace. All the court cards are entirely customized, and while they have a traditional look, they use white/grey style line drawings to picture our royalty. Against the inky black background, the contrast is striking. As for the pips and indices, they are the same colour grey for all the suits, the result being that the distinction between the traditionally red and black suits is not at all immediately obvious. This, along with the choice to use non-conventional and unusual pip shapes (especially the diamonds) and a semi-cryptic font, make this a deck that is not ideal for playing games of cards, or for performing magic, since the cards aren't easily and quickly identified. But they sure do look pretty, especially the court cards with their white/grey line drawings on black. The entire deck has a very unified look both front and back and throughout. The matching Jokers continue the dark industrial theme, and one has a King of Clubs reveal. The gas-mask figures seen here also populate the promotional video, and suggest something about being hidden, as well as reflecting the urban context that the deck captures. The imagery and symbols also have some connection with the themes from the Revolution deck, which was created by the same producer and the same artist. The two additional cards provided in this USPCC produced deck are both interesting gaffs - a white Ace of Spades that could be used to perform an interesting colour change, and a gaffed 3 of Hearts with a Queen of Hearts reveal built into one of the pips. It's a pity there's no link to a website which gives a simple routine that could take advantage of these unique cards. But perhaps that's just because this deck doesn't really know what it's trying to be. It's less than optimal for card games and for magic, since the minimalist colour scheme and unusual pips/fonts makes it hard to distinguish between the cards at a glance. I like the idea of a tribute to night-time street artists, but the problem is that the veil of darkness also makes it impossible for us to appreciate their craft. 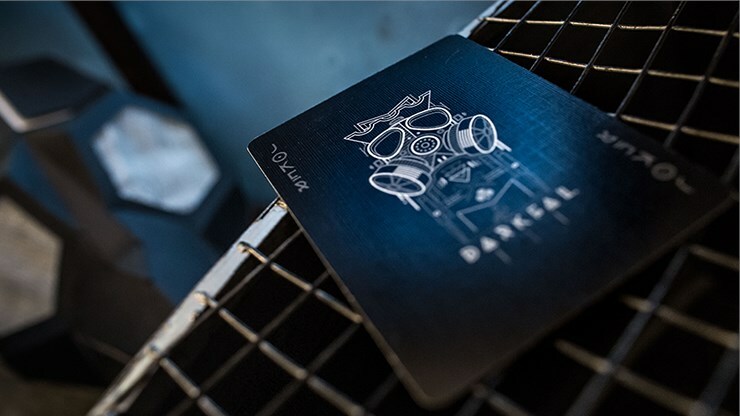 Being impractical for games or magic, leaves Darkfall for the hands of cardists. Admittedly, the back design with singular shapes designed on either end is something seen quite often in card flourishing, and it can emphasize cuts and spins. Having black on both sides also means that nicks and chips will quickly show up - but that's normal for any black deck. And everything about this deck does work together thematically, so those who are attracted to the underground street art theme, may enjoy having a deck like this in their collection.